A serger is used for overcasting on fabrics to prevent clothing from fraying at the edges. If you are looking to buy the best serger sewing machine, then there are only two brands in the market which most sew people trust Singer and Brother. Brother serger is one of the top-rated sergers in the market, and among all the models 1034D is the most popular. However, this year Brother has introduced the new model namely, 1034DX which is even more superior to its predecessor. The price of brother serger 1034DX sewing machine is 80-90$ up from its predecessor. However, it is worth every penny. 1 What is the best brother serger sewing machine? 2 How Fast You Can Sew with Brother 1034DX? 3 Brother Serger 1034DX Review – What’s New? What is the best brother serger sewing machine? Brother serger 1034DX is the ultimate serger that you can trust with all of your projects. Fabrics such as knits, linens and formal wear you can get the professional finish with this unit. During our on-hand review, we have done some experiments with brother 1034dx serger. We created ruffles, decorated edges of skirts, joined laces, serge narrow sleeves and more. We even used it on spaghetti straps which really made it look more costly. Brother 1034DX is a very reliable and high performance 3/4 thread serger delivers professional results even if you are just starting to learn new sewing patterns. Most stitching projects use 3/4 different color threads for ultimate visual looks. The brother 1034DX serger includes color-coded guide printed on the sewing machine which enables you to remember the place of thread. How Fast You Can Sew with Brother 1034DX? Fast stitching is one of the basic requirement from professional tailors and fashion designers that let them finish the project on time with perfection. Brother 1034DX has up to 1,300 stitches per minute which is very impressive. With such fast per minutes stitches, a good hand that knows how to play with a sewing machine can finish any skirt or wedding dress projects in less than 3 days. Even you are a beginner or an intermediate, this unit can help you finish professional overcasting in less than a week. Brother Serger 1034DX Review – What’s New? Our Verdict: Buy 1034DX for the ultimate finish that you have never seen before. Many baby lock users are confirming it that this new model is smoother than ever. Brother 1034DX serger sewing machine has fabric feed which let user produce a professional finish even on various types of fabrics such as thin, knitted and stretchy fabrics. We know that sewing patterns vary according to the fabric type and demand, however, flexibility is always better. You can choose 3 thread setting or 4 thread setting for enhanced overlock seam or overlock stitching projects. 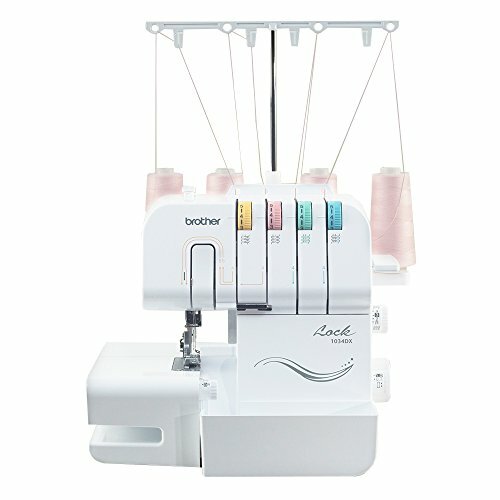 This new model 1034DX from Brother even let you switch between 3 or 4 thread without threading the entire machine. The color-coded guide helps you to keep the color of threads in mind while you are seaming or stitching. It comes more handy when you are working on several projects at the same time. Everyone loves fast work which is why Brother 1034DX serger has kept in mind. It has fasting serging ability that can sew up to 1,300 stitches per minute. Don’t worry it does not run that fast all the time. You can control the sewing speed with the foot controller. Using less pressure will result in slow speed and vice versa. Stitch width is important to create serged seam finishes that lie flat on the fabric. When you are working with lightweight fabric, such stitch width control can be truly essential. Brother serger 1034DX comes with stitch width adjustment dial on the side of the machine which you can turn according to the need. The width can be change between the range of 5.00mm(3/16 inch) and 7.00mm(9/32 inch). Constant feed is very important during stitching while creating a gather or trying to keep it even without causing any puckers. Differential feed ration is helpful when you are working on different sewing project having various size of weight fabric. The lower feed can be used for lightweight fabric and high feed can be used for heavy fabrics. With a turn of the differential feed dial, you can create decorative lettuce edges that will look beautiful when done correctly. With Brother 1034DX serger sewing machine differential feed, you can control the movement of feed dogs that move the fabric throw the machine. As a beginner, you might not find it useful, but ask any expert they will tell how essential this feature is for perfect sewing and stitching. The brother 1034DX serger comes with 3 feet to suit essentially any project you are working. So now you know that these foot variations are boon for any budding fashion designer and another reason to buy 1034DX serger right now. Every good serger has a built-in knife that trims fabrics which further can be collected or used. 1034DX comes with a removable trim trap that collects them as serger knife trims and serges project. This trap is easily detachable and many people use it to store foot controller when not in use. So you can achieve two goals smartly with one unique feature. Using serger can be overwhelming for even experts, however, there is nothing to worry if you are buying brother 1034DX serger. It comes with instructional videos that help you learn faster. If you are not so digital friendly then grab their printed manual which comes with the package and read about everything that you can eventually do with this brother sewing machine. Earlier in this Brother Serger review, we learned its ability to sew up to 1,300 stitches per minute. While it is impressive, but you don’t need the same speed for every project. Sometimes you need slower speed or say medium speed to get the ultimate result. The complete package when bought online comes with 2 snap-on feet speed controller, that let the user manipulate stitching speed. For top speed, you can apply more pressure on the foot controller, and if you are working on lightweight fabric then reduce the speed by lower the pressure on the foot controller. Most professional and Entry level machines are very costly and can cost you more than $500. In many stores, you can find it for a very affordable price. However, if you buy 1034DX online then it comes at a huge discount. Check out the latest price of this new unit. If you will look into the manual of the lower back of the brother serger, you will notice the customer support number. You can call at this number for free support about everything. The backend team is very informed, educated and potentially capable of solving every query on the phone itself. If super support does not satisfy you then don’t worry you are covered. Brother serger 1034DX comes with a 25-year limited warranty by the company. This includes the sewing machine parts and other hardware support. Here is a video tutorial which we think is perfect to understand the threading brother 1034Dx serger. Follow these steps and you will be good to go. It does not matter if you are threading it for the first time, just follow the instructions above in the video and you will not face any issues. Buying Brother 1034DX serger seems to be the best if you are starting out or already an expert. Because it gives you immense freedom and has complimented the unique features of its predecessor 1034D. However, this new unit has a removable trim trap, better engine placement, different feet for various sewing projects and overall better ergonomic design. If you already own 1034D brother serger and its working fine then you should not be looking for a change. However, if you are looking for a change then just upgrade your old serger sewing machine with this all-new Brother 1034DX serger for better grip and smooth stitching. We love to share our creativity with needle and thread. Get to know our thoughts on various stitching products. Don't forget to share our article within your sewing circle.